Since I arrived in Bordeaux a week ago, I have eaten out twice at the same bistro. The cheapest way to visit France in these dollar doldrums is to rent a flat through one of the online services like vrbo.com or homelidays.com (horrible name, but I found my big gorgeous flat there). With a kitchen, it’s possible to cut your expenses in half and really acquaint yourself with the bounty of the region. Admittedly, as the last post will attest, cooking in France and in an unfamiliar kitchen doesn’t come easily. But I swear it is all worth it. On the last day they were here, my friends, Ann and Jonathan, and I had lunch in a little bistro in a section of central Bordeaux that couldn’t have closer to the tourist spots. We looked at the menu and decided to give it a try. While we waited for our food, we noticed that we were surrounded by French people and that a line was starting to form. No longer a sucker for the old “we were the only anglos in the place”-type of flimsy recommendation, I reserved judgment. The food was downright good. We shared a chaotic, delicious salad with goat cheese on toast, to begin with. Ann had a haunch of rabbit in a parsley sauce, accompanied by fettucine, that was very tasty. 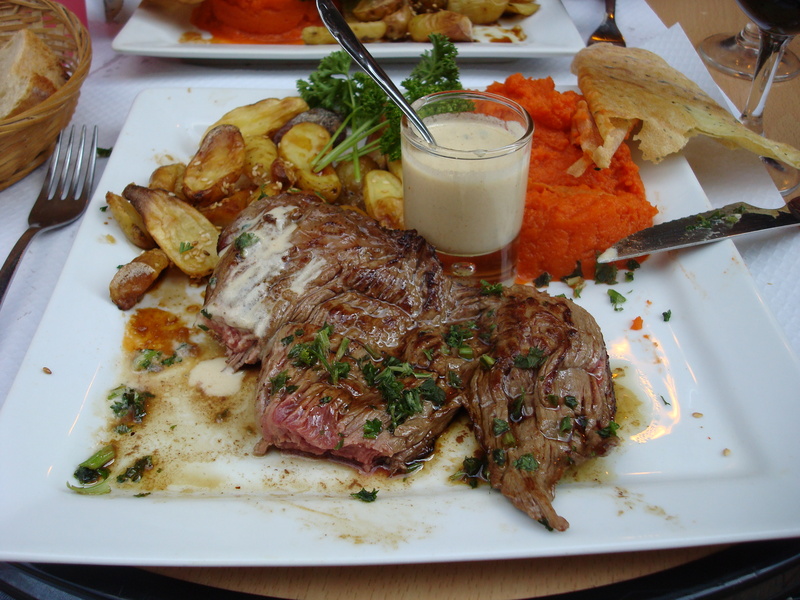 Jonathan and I each ordered the bavette (maybe skirt steak in English) with rocquefort sauce, roasted potatoes, and a exuberantly vivid purée of carrot. What we ate made us very happy. Ann noticed that the cook used soy sauce to deepen the flavors of her rabbit. Jonathan and I found the same touch in the small roasted fingerling potatoes that came with our steak. I came back to give the place another try yesterday. My first attempt to secure a seat at 1 pm failed. I killed time and quite a few dollars at the excellent nearby bookstore, Mollat. When I returned half an hour later, I was seated immediately. The steak tartare I ordered came with an egg yolk in half an eggshell on top and a little salad. I could taste soy sauce instead of worcestershire sauce in the meat, but it didn’t matter. It was a very good lunch. That dish plus a small carafe of wine (big mistake: I felt like napping instead of returning to the archives) came to 15 euros. Yes, an expensive lunch. But so substantial that the light dinner I would prepare for myself back at the flat seemed to compensate. 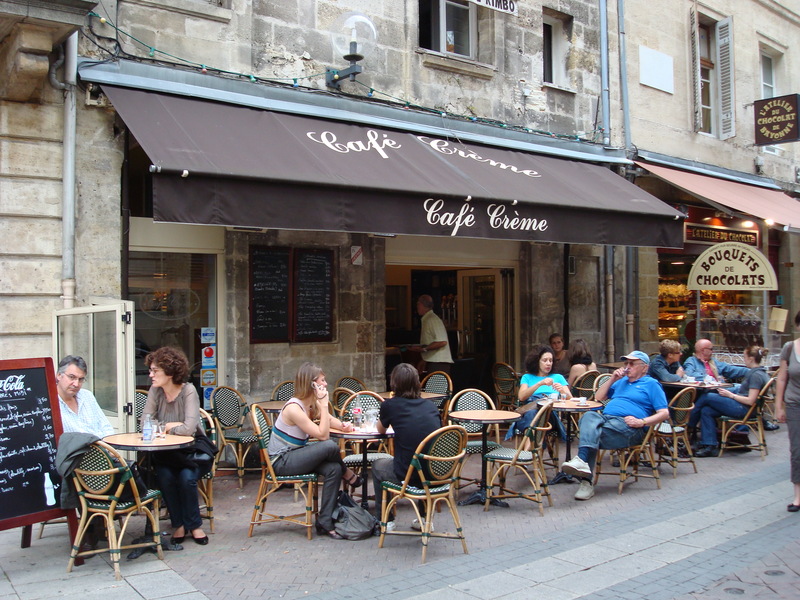 So, to find this bistro, go to the Place Gambetta, lay your eyes on the tall Porte Dijeaux, and just inside the porte, on the river-side, you’ll see a little lunch place. I’m pretty sure they don’t serve dinner, as the photo above, taken at 5:30 pm, suggests. It’s well worth a visit.